What will the risk products of the future look like? To download a video, click on the image (6.7MB AVI). Goldstein, D. G., Johnson, E. J., & Sharpe, W. F. (working paper). Measuring Consumer Risk-Return Tradeoffs. Coming soon to a journal near you. Can I see a video of the Distribution Builder? Yes, click on the image above to download. Can I show a video of the Distribution Builder to my class? Yes, this video may be used for non-commercial purposes, as detailed in the Creative Commons License on the main page of this site. I need to gather distributions from people for an experiment I am running. Can the Distribution Builder do that? Yes, the Distribution Builder can be used to elicit any kind of distribution, constrained or unconstrained. I want to study people’s preferences for two-alternative gambles, can the Builder do that? 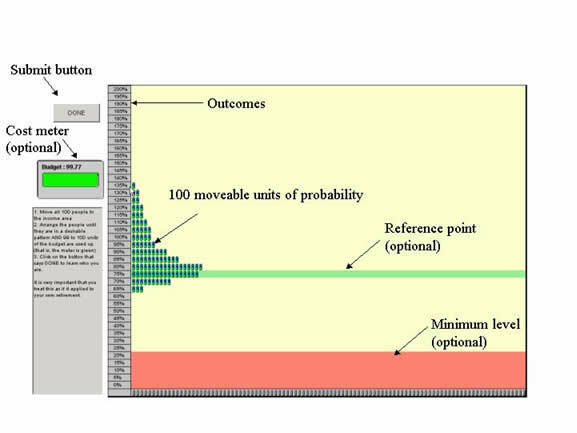 Yes, the current Distribution Builder can display between 2 and 100 units of probability. I want to have people create gambles they see as equivalent to other gambles, given constraints. Can it do that? Yes, the Distribution Builder can be set such that any number of the markers are fixed in place. Is the Distribution Builder publicly available? We hope to make the basic GUI framework available in the future, with no promises as to when that will be. Watch this site for more information. What will the risk products of the future look like? was written on January 11, 2006 and filed in Research News.